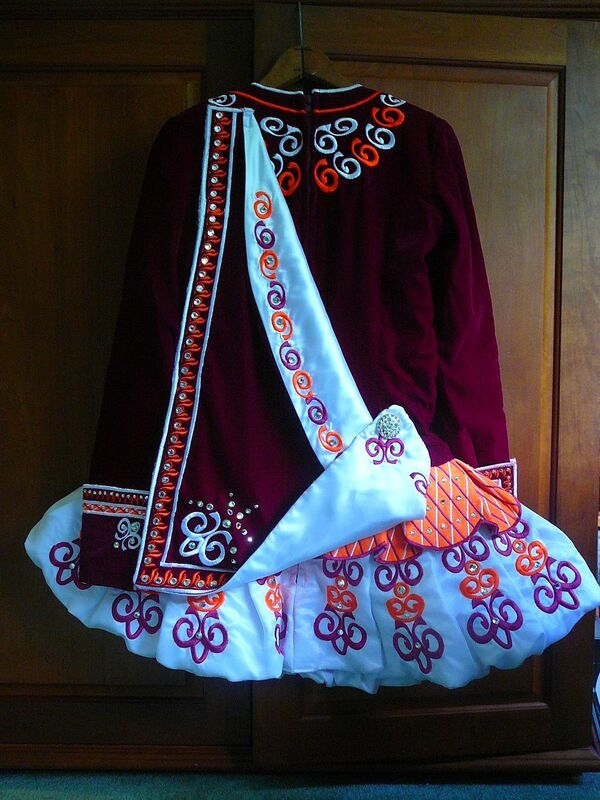 For sale is an elegant championship level solo dress made by Jean Olsson of Massachusetts. The bodice is made of deep rich raspberry micro velvet from Dubai. The bubble skirt is made of white satin with a sheer overlay. There is a stiff ruffle made of neon orange satin with a sheer overlay over the top of the bubble skirt. 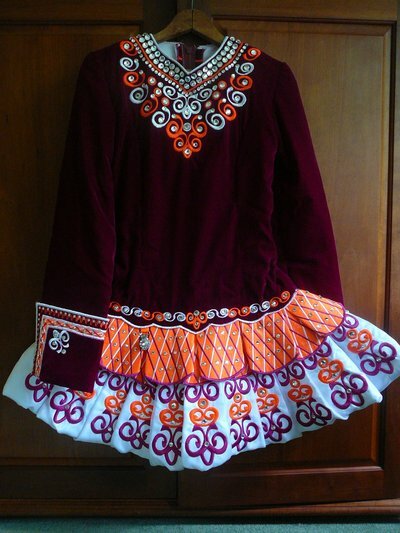 Embroidery on the bodice is done in white and raspberry, and that of the skirt is in raspberry and neon orange. The stiff ruffle layer has been embroidered in a crisscross pattern. The trim on the accompanying soft shawl echoes the crisscross embroidery of the ruffle layer. The same motif is repeated on the french cuff of the sleeve. The dress is loaded with genuine Swarovski crystals in various size sizes. The attention to detail is amazing and the dress has beautiful stage presence. Sale includes bloomers (in magenta) and an embroidered headband in white. 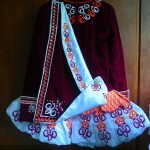 The dress, made in September 2009 for Oireachtas and worn three times, is in pristine condition. It is being sold as dancer has retired from competition. Asking Price: $US1600. Shipping costs are included for my own country, overseas shipping is extra. Returns are negotiable.